This article will help you to know the process of how to correctly install CO2 laser engraving and cutting machine with pictures and videos. 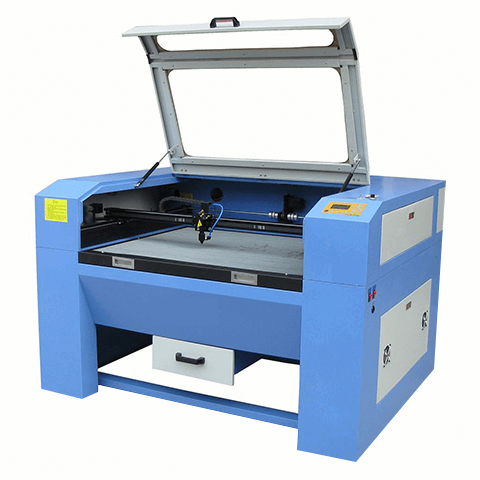 How to install CO2 laser engraving and cutting machine correctly? This is a key point, CO2 laser machine will go well only when you install the CO2 laser machine correctly. Don't worry, this article will help you to know the process of how to correctly install CO2 laser engraving and cutting machine. 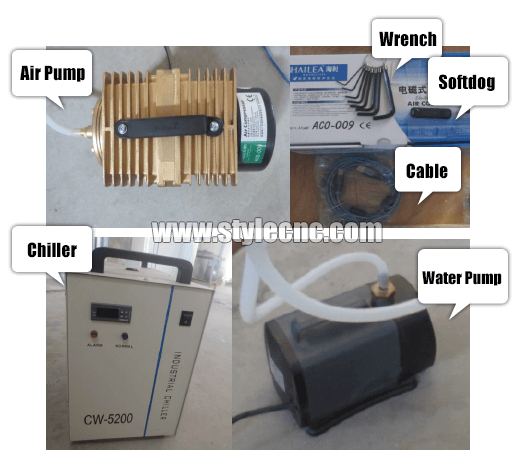 Open the front door ,side-door and get all the extra parts of the machine out ,like : water chiller/water-pump , dust collector , air pump ,laser tube ,Softdog ,Rotary etc. After you open the front door ,please cut the tie on the belt of the X-axis and Y-axi, get the CD , then move the laser head to the center of the working area by your hand. 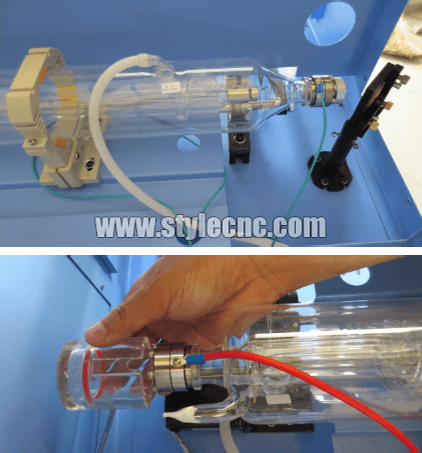 The most important step to correctly install a CO2 laser engraving and cutting machine is to install the CO2 laser tube. So, pay special attention here! 1. Take the laser tube out of the package slowly , then put it on the laser tube socket at the back of the machine. 2. There are two ends of the laser tube. One is laser light out and the other is high pressure end . 3. If the laser tube has the plastic protective sleeve , please cover the protective tape. If not , please cover sufficient waterproof tape . On the laser light out is the water out , behind the high pressure end is the water in . The theory is “low in high out”. 2. 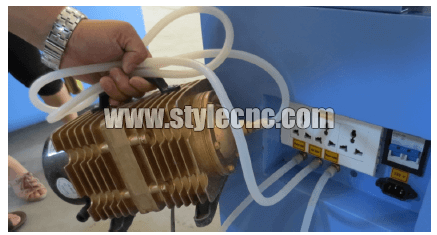 Water pump : connect the silicone tube with the water outlet of the water pump with the water inlet of the laser machine . 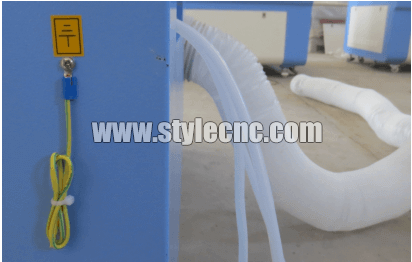 Then use the other silicone tube connect the water outlet of the machine with the bucke. 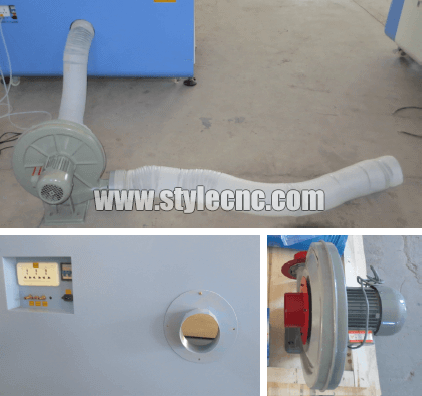 Connect the exhaust port of the dust collector with the telescopic pipe of the laser machine . Connect the ground security, find a wire (above one square metre), and should connect the machine to the ground. the other end connect the steel bar, it must be buried under the ground 1.5 metre. If in the wet place, the bury depth can be shallow. You should check wether all parts of the laser machine are installed correctly and wether the electrical accessories and line are dropped or damaged. This is aslo significant to correctly install a CO2 laser engraving cutting machine. Our CO2 laser machine should use the power with the 220v. 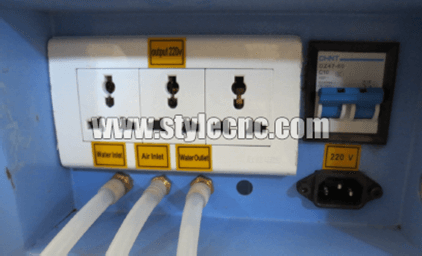 If you local power is 220 v , you can connect it directly. 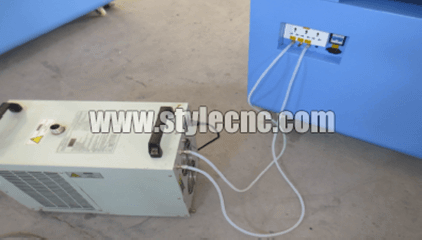 If not , you need an extra power transformer for the machine to the change the power. First ，supply the power to the water chiller . Then check the silicone tube to see whether it can make water , special whether the water flow is normal . Connect the power: connect the 220v power to the laser power and open the urgent stop, thenthe power locks in order to see whether the power is normal . Press ESC twice ,then press the up-down-right-left on the Leetro control panel to see whether the laser head can move normally . Plug the softdog in the computer, copy the data of the CD to the computer, use the blue data cable to connect the computer with the leetro card , then install the software correctly. Open the Lasercut icon on the computer desktop , and design a circle about 40*40 mm , the processing method is ( cutting ), speed is ( 100 ),power is ( 1 ),then download to the machine. Move the laser head to the proper place then press “test” to see whether the laser head can go around the border. If it is normal ,press “start” and begin work . 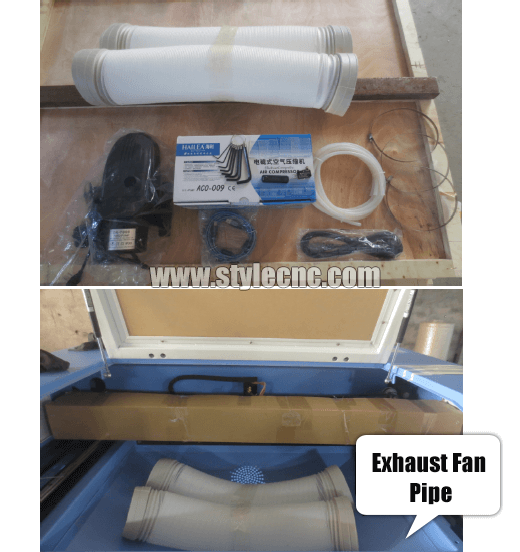 Hope the 12 steps can help to remove your confusion about the installation of CO2 laser engraving and cutting machine. If you sill have any questions, please feel free to contact with us. We will try our best to help you. 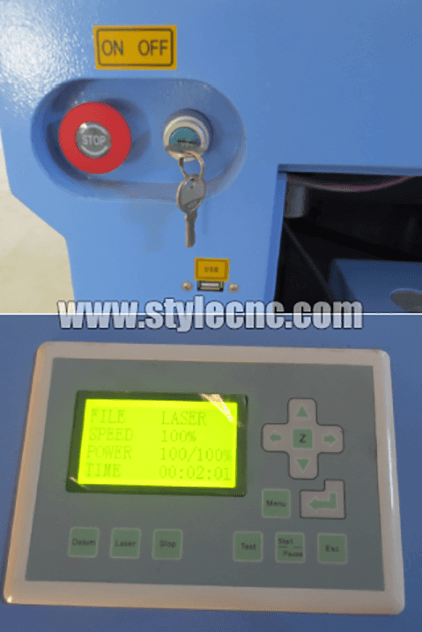 License: The text of "How to install CO2 laser engraving and cutting machine correctly?" 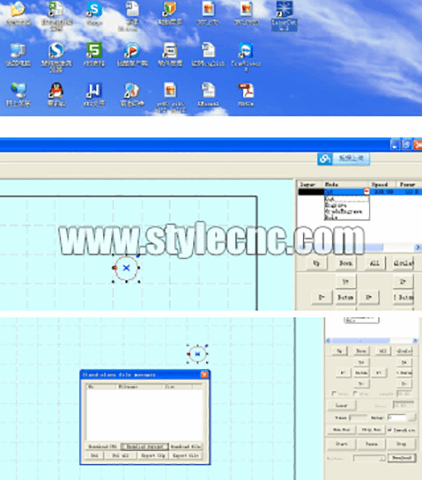 by STYLECNC is licensed under a Creative Commons Attribution 4.0 International License. • Next: Why CO2 laser cutting machine X axis and Y axis shaking?